A wooden door can give your garage a sense of warmth, integrity and natural beauty. For these reasons, many out there would never consider parting with their wooden designs for alternative materials. The problem with wood however, is that it can decay faster than glass or metal. If you haven't had any work done on your wooden garage door for several years, it may be suffering from the common consequences of such neglect. Cracking in the paint, molded edges, unbalanced surface finishes and so on. Here we’ve put together a list of the best ideas that if applied can quickly and affordably turn your old and tired garage door into one that looks brand new. Whether you're giving it a go yourself or looking for a professional company to do it for you, these options will likely prove the most efficient in terms time invested and results gained. This is truly the most cost effective and one of the least time consuming ways to convert old wood into new. Going over the surface of a door will take a good few hours with sandpaper by hand, but will of course cost next to nothing. An expert would probably use a sanding machine which should usually get the job done within less than an hour. If repainting, this needs to be an outdoor weather proof solution. - further, the more coats you put on, the higher the quality of finish and the longer the paint will last before showing signs of degradation. Once the surface has had a good sanding, you can choose whether to paint it or instead glaze it with a varnish. What you get from varnished or glazed wood is a natural look. Varnishes are transparent so they show the natural details of the wood itself, while adding a deep color that soaks into the wood to give it an appearance with more vibrancy and life. If you want to add more character instead of just a basic rejuvenation, you might want to consider adding a decorative metal hardware to the wooden frame. 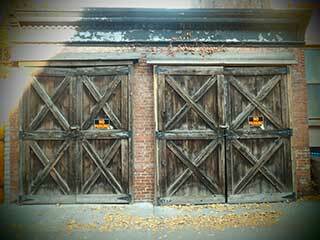 Common examples might be dark iron arrows, or pieces that imitate old fashioned garage door hinges on the sides of the doors. The combination of wood and metal can create an aesthetic that will make your door project a feel of quality and stability. If you're seeking professional help when it comes to revamping your wooden door, just give our experts at Garage Door Repair San Francisco a call - we've got all the know how and tools, we'll be happy to help.